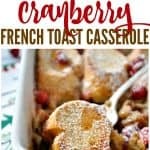 Make winter morning special with this overnight french toast casserole, easy, delicious and packed with flavor! 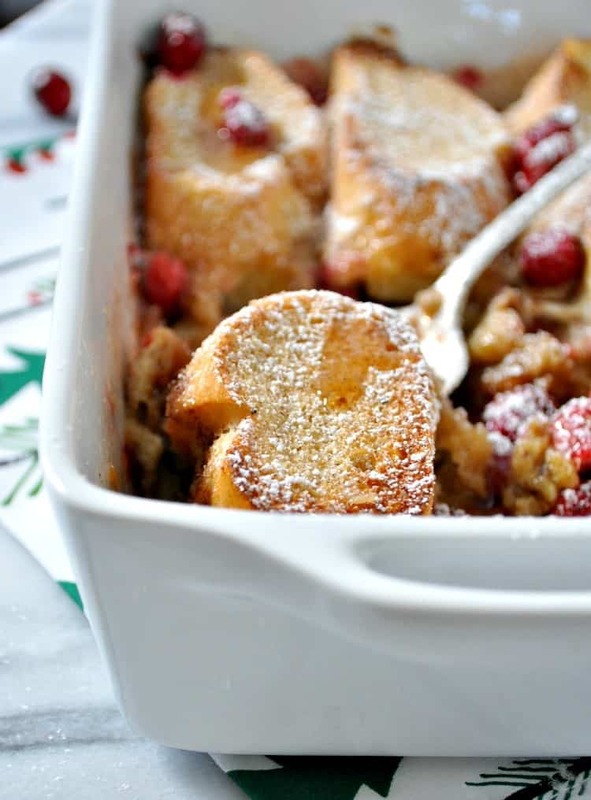 Make winter mornings special with festive holiday recipes like this easy Cranberry Overnight French Toast Casserole! It’s a classic make-ahead dish that’s perfect for Christmas brunch, overnight guests, or any other seasonal gathering — and it won’t have you stuck in your kitchen for hours! Hi, friends! It’s December — woohoo! This is such a fun time of year (especially with a house full of kids), and I love adding simple traditions and treats to our normal routine to make the season magical for everyone. Whether it’s an advent calendar, an afternoon of cookie decorating, or hot cocoa while watching The Polar Express, these little moments all add up to create a holiday season of joy! The recipe I’m sharing today is one of our go-to breakfast or brunch options that I have been making for years now. I received the original recipe from my mom’s friend at my bridal shower over 10 years ago! Aren’t tried-and-true dishes from friends and family always THE BEST?! 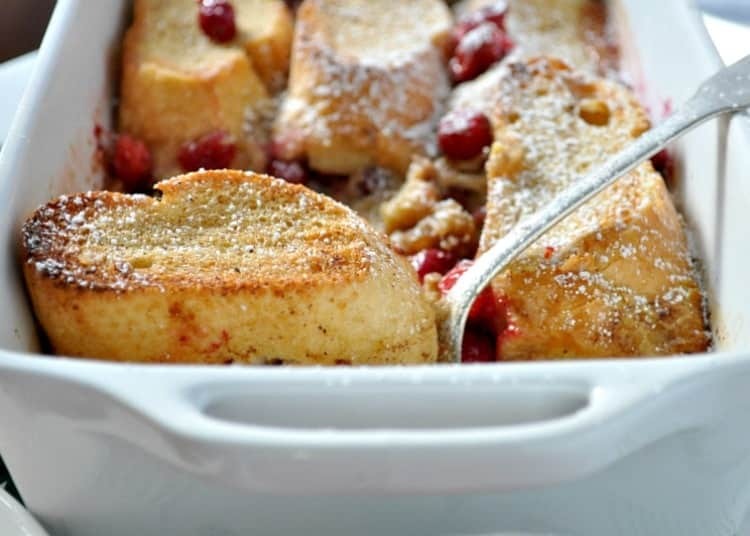 My twist on Carol’s Overnight French Toast Casserole adds the cranberries for some festive color and a little tart bite to complement the rich custard and the sweet, sticky syrup. 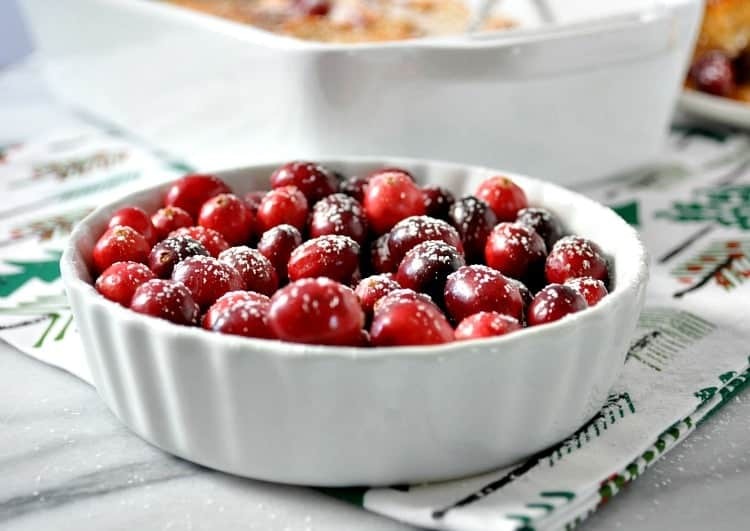 Really, is there anything more beautiful at this time of year than simple, fresh cranberries dusted with snow (or, powdered sugar)? 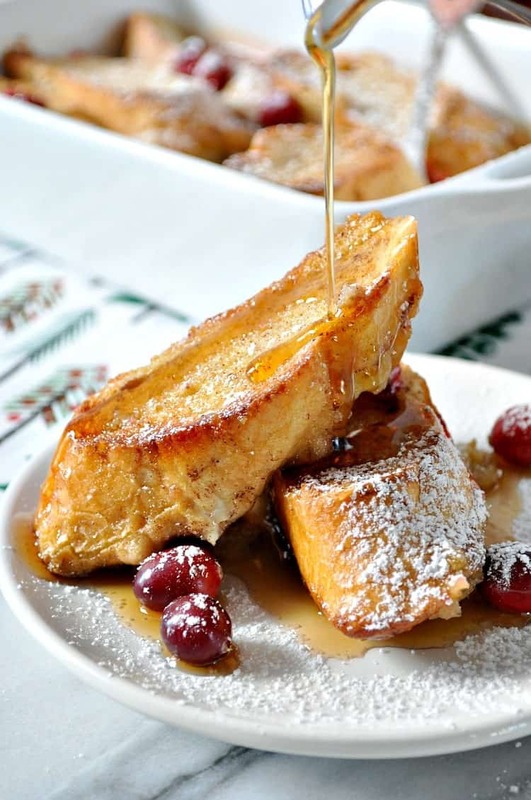 This Overnight French Toast Could Not be Easier To Make! And while this Overnight French Toast Casserole is obviously incredibly delicious, I love it most of all because it is EASY. You know I love to find ways to simplify the holidays, right?! I can prepare this dish in advance (making it perfect for Christmas morning), and then I just have to bake it in the oven for 30 minutes before we’re ready to eat. And this particular custard is so decadent because it includes Dunkin Donuts Extra Extra Coffee Creamer, which is made with real cream and sugar. I grabbed my creamer when I was running errands at Target last week. You can find it in the dairy case right near the milk, along with about a zillion other holiday-flavored creamers too (Frosted Sugar Cookie or Peppermint Mocha, anyone?). 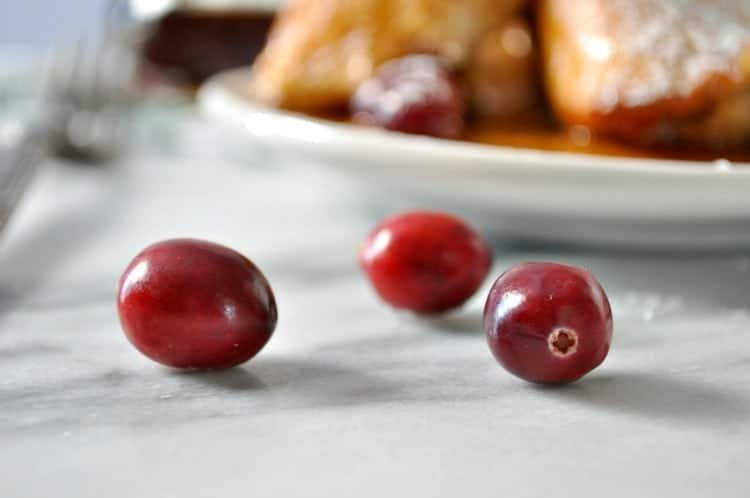 Fresh cranberries are baked underneath and on top of the bread, so they soften, caramelize, and cook in the gooey syrup for a perfect blend of sweet-and-tart flavors! This is the easiest way to prepare overnight French toast, and it’s delicious every time. There’s no need to stand over a griddle when you’d rather be opening gifts, sipping coffee, or snuggling with your family. Plus, it comes out perfectly crusty on the outside, tender on the inside, and full of sweet, creamy, warmly-spiced flavor! Have a wonderful holiday season with your loved ones, celebrate the special moments, enjoy creating new traditions, and keep it all simple! Melt butter, sugar, and syrup in a small saucepan over low heat. Bring to a boil and allow to boil for 1 minute (be careful not to burn). Spray a 9 x 13-inch baking dish with cooking spray. Pour melted butter mixture into the bottom of the pan. Sprinkle with half of the cranberries. Place the slices of bread on top. In the morning, remove plastic wrap and bake at 350°F (180°C) for 30 minutes. Dust with powdered sugar and serve with syrup. *If you don't have time to refrigerate overnight, that's fine. 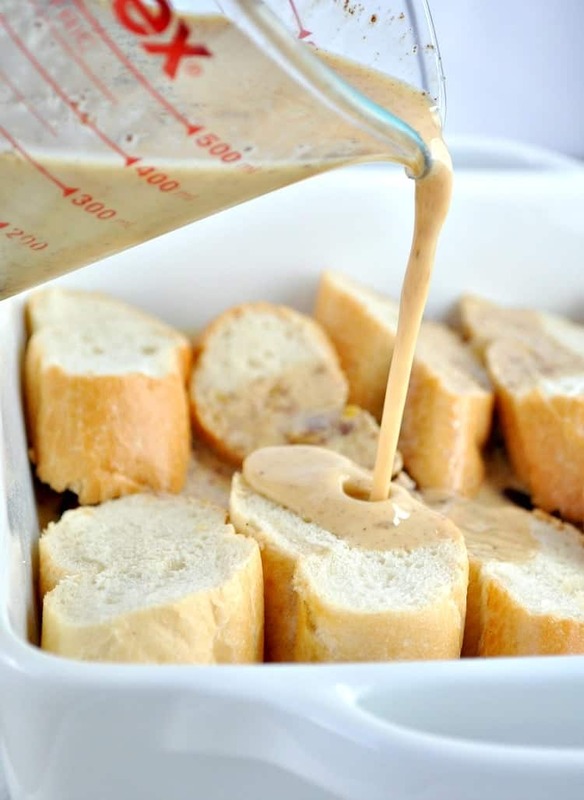 Just soak the bread in the custard for as long as possible (or at least 1-2 hours) before baking. Are you ready to make this casserole yourself? Pick up the ingredients at Target, and be sure to use Target’s Cartwheel app to search for offers, scan products for coupons, and save them all to your own personal savings barcode to be scanned at checkout. You can even use Cartwheel to build your shopping list so you don’t forget anything, making life even easier this holiday season. And you’re in luck! This month Cartwheel will be offering 5% off on International Delight, Dunkin’ Donuts, and Silk Coffee Creamer from 12/1/15 – 12/24/2015! Be sure to stock up on all of the festive holiday flavors! 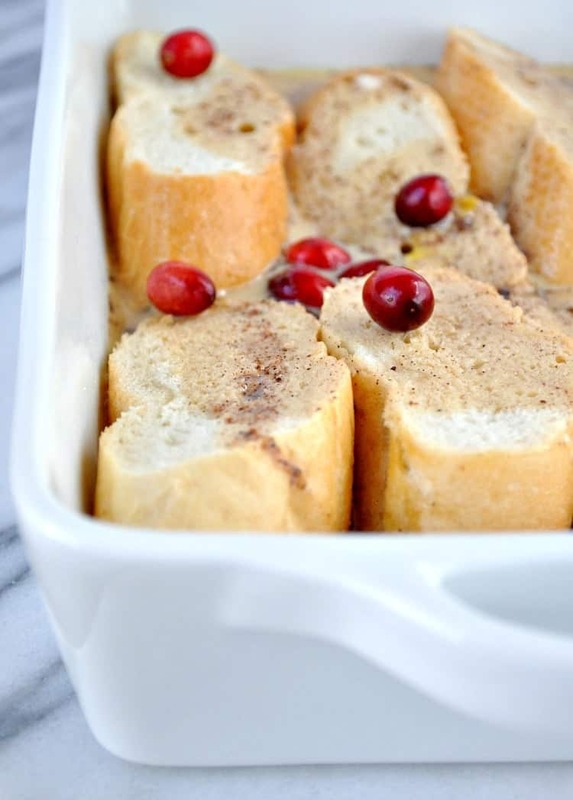 French toast casseroles are my favorite, especially during the winter! 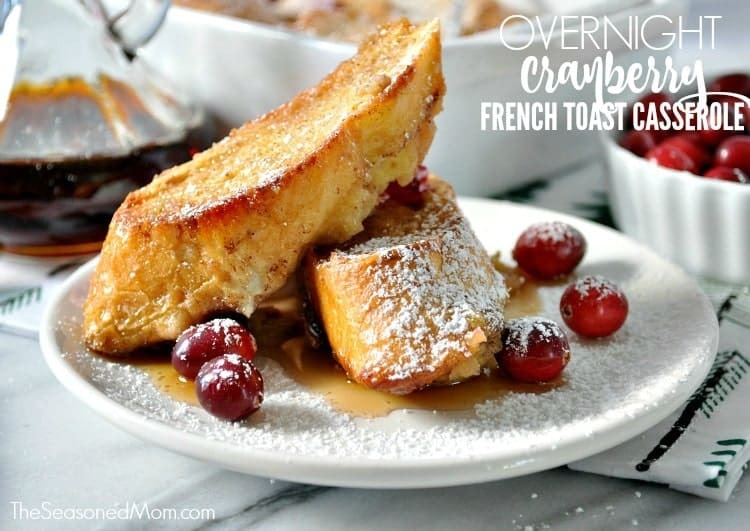 This cranberry version looks like the perfect treat for Christmas morning! They’re definitely my favorite, too! Such a delicious and EASY way to celebrate! What a lovely dish you’ve been making over the years! I can see why it would be so popular. I love easy, make-ahead brunch dishes so everyone can enjoy and no one is tied to the stove. Your photos are simply gorgeous! Now I’ve got to go find your latest cookies too because I was getting hungry looking at them on Instagram! I’ve never seen this before, but I love recipes with “overnight ” in them. This is a great idea and looks so delicious! Thanks, Mary! 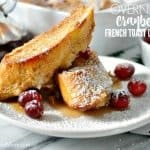 Definitely give this one a try — you’ll never go back to the old way of making French Toast again! before, great time saver! Thanks! Duh! Sorry about that! 🙂 Yes, it’s 350 degrees. I’m headed over to fix the recipe right noW! Thanks for letting me know, and enjoy! Just finished making this and it’s still runny. What did I do wrong? I baked it uncovered, and until it was brown. I’m thinking the bread didn’t soak up enough because the top was kind of hard. Still really good, just kind of mushy! Darn…I’m so bummed that it wasn’t perfect, but at least you could still eat it (kind of)! Hi, Louise! The dunkin donuts creamer is just basically sweetened cream. You can substitute with another brand of coffee creamer or you could just use half-and-half or regular cream. If you use the half-and-half or regular cream, the custard just won’t be quite as sweet. It will still work great, though! I want to make this in the summer. Can you substitute a summer fruit? Hi, Jill! Absolutely! I think that’s a great idea, and blueberries, strawberries, diced peaches, or just about any other similar summer fruit will work perfectly in the same quantities. Enjoy!